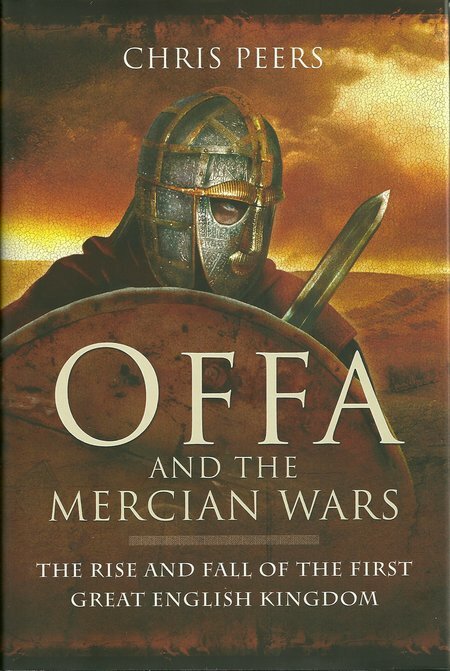 DESCRIPTION: The publisher has released two books (“Offa and the Mercian Wars” and “The Anglo Saxons at War 800-1066”) that partly overlap, but individually bring fresh insight to the Dark Ages. The Dark Ages is a period of mystery and perhaps the most intriguing period of British history. It was during this period that England was born as a nation out of a collection of Anglo Saxon kingdoms. From this base, Britain was established and expanded eventually into the United Kingdom and on into the British Empire. This new book covers the development of the Mercian Kingdom and covers the period from the end of the Roman presence in Britain to the Viking wars of the Ninth Century. Before the Dark Ages, the British Isles were born out of the British Peninsula when the North Sea inundated the land bridge that had connected Britain with Continental Europe. Before that time parties of hunters had migrated west across the land bridge and farming began. After the land bridge was destroyed, migrants still came into what was now a collection of islands. No records descend from these early times and in historical terms it was truly a dark age, emerging slowly, only in isolated discoveries from archaeological research. Virtually nothing is known of the boats used to make the crossing after the inundation of the land bridge. Before the Roman invasions, the Celtic Britons had already developed areas of wealth, primarily around the mining and smelting of metals, but there was also well-developed agriculture, with pear orchards and a growing wool trade that was to expand and remain a key to British wealth until the Industrial Revolution, as the climate began to warm. By the time of the Roman invasion, the climate had warmed to the point were it allowed Roman vineyards to be established as far North as York, suggesting higher temperatures than exist in the first two decades of the Twenty First Century. When the Romans arrived, they brought architecture in stone, brick and tiles, linking their forts and settlements with metalled roads. They also built bridges and recorded tax collections and day to day life. Their records were by no means complete or impartial, rather, we have a collection of fragments, snapshots of Roman Britain, augmented by surviving buildings and engineering works and the uncovered remains of buildings. As these fragments match more complete Roman records from the centre of their Empire, we have a reasonable idea of life in Roman Britain. One reason for the Roman records being less complete than for other parts of the Empire may have resulted from the use of legions with soldiers from some of the more remote parts of Empire, perhaps also a reduced interest in a collection of damp islands that led nowhere else, sitting on the fringe of Empire. The construction of Hadrian’s Wall suggests that Rome was unprepared to devote resources to an invasion of Scotland and its islands, although there is much evidence of roads and forts north of the Wall that demonstrate much greater Roman campaigns than has been generally recorded or accepted. There is a lack of clarity about the raids from Batavia and Germania on the British coasts before the withdrawal of the legions from Britain, although there is evidence that Britons hired mercenaries from Germania to help repel raids from Wales and Scotland and that those mercenaries reported home that the islands were rich and the local population poor warriors. The probability is that raiders began to cross the North Sea from Scandinavia and the North West German plain before the Romans left and that these exploratory raids increased as the raiders discovered a reduced military force against them. A major weakness would have been the withdrawal of Roman naval vessels. However, there is a growing appreciation that immigration to Britain from Germany may have been a steady flow before the arrival or the Romans and continued during the period of Roman rule. In general terms, it can therefore be argued that the Anglo-Saxon or Nordic raids and wars began in the Fifth Century, or possibly earlier, and continued until 1066. After 1066, the Norman French descendents of Nordic raiders established a new form of government, establishing a feudal state that was able to defend its borders against future raids and invasions. The author has taken the middle kingdom that became Mercia, but which has also been described as Southumbria, covering a period still shrouded in mystery. The title is slightly misleading, because the author has wisely provided a review of the period before Offa became King of Mercia and expanded the Mercian kingdom, and continued the review to include the Viking raids of the Ninth Century. This makes it much easier to understand the successes of Offa as a perspective of the early and mid Anglo Saxon period. Although many have accepted the description of a Dark Ages as a period where very few historic records survive from what was originally a sparse collection of written records, and where the later generations of English failed to perpetuate the rich spoken history that was kept alive in the poems and sagas told in the winter halls, there are also theories that this was literally a Dark Age of lower temperatures between the Roman Warm Period and the Medieval Warm Period. The theories cover two main groups of opinion. One group believes that volcanic activity and meteor showers, with some asteroid impacts, created a dust cloud in the upper atmosphere that shielded the Earth surface from the Sun and both reduced the global temperatures and the light levels on the surface. The other group regard this as one of the many cooler periods between relatively brief warm periods. Achieving clarity is not aided by the fact that what written records survive were those created by monks who were biasing their accounts in an early form of propaganda to favour the Saxon Royal Families and particularly the Wessex and Northumbrian Kings. As a pagan kingdom long after other Anglo Saxon kingdoms converted to Christianity, Mercian history is largely viewed from the perspectives of those who feared and/or hated the Mercians. One of the more curious aspects of the historical view of the period is that the label “Anglo Saxon” suggests that a massive wave of Germanic people swept across the British Isles, forcing the native Celts into less hospitable margins. This is really a false picture, as is now being proven by DNA analysis. It is becoming clear that Germanic settlers have been present of a much longer period and that the numbers arriving after the Fifth Century are much smaller than previously thought. It is also becoming clear that these new arrivals came from a much wider geographic area of Northern Europe and Scandinavia and that the Viking invasions involved a similar mix to include people from the North West German plain. The author gives one example in mentioning that the East Anglians considered that their roots were in Sweden and not further South as has been widely assumed by historians. As our understanding improves, it is becoming clear that neither the Anglo Saxons nor the Vikings engaged in ethnic cleansing as a deliberate primary policy, but settled alongside the people who had arrived in the centuries before them. The author has covered the various conflicting theories, and added his own conclusions where prudent. A large part of this account is likely to survive, but new studies of the period are continuing to uncover new facts and change many of the established views that are based largely on the Saxon Chronicles and other Saxon records that have survived. The surviving written records provided by Bede and the Saxon Chronicles are almost contemporary with events and even after allowing for political and religious bias provide the only written history. Archaeological discovery supports and sometimes conflicts with the surviving written accounts. That leaves only Saxon poems such as Beowulf and the Scandinavian sagas. The fact that they are oral histories has led to many historians discounting them as unreliable, especially when they conflict with popular wisdom. A saga may have been intended for popular entertainment in the long winters around the hearth, or it may be a private saga intended to guide future generations of a family. As a result the public entertainment saga has been embellished as it has been retold and includes much clearly fictional material in the interests of entertaining. Of the Nordic expansion, only Iceland has preserved its family and folk sagas, which receive few airings outside Iceland. The Galwegian families preserved their sagas as a spoken history until very recently and began to write them down in the Nineteenth Century as changing lifestyles made the regular winter telling more irregular and less dependable. Those sagas were intended to guide future generations of the families and not for sharing outside the family which is unfortunate because they differed from Saxon and Christian records but have been proven accurate through recent archaeology, notably the discovery on the North American East Coast of the remains of Viking settlements. When history is often told many times from many directions from a mass of written and film records, to the same result, a rewarding aspect of the Anglo Saxon period is that it is a period not so ancient but still a period when many great discoveries are yet to be made. Books such as this play an important role in firing the imagination of new generations of explorers who will make fresh and significant discoveries to bring more light into a Dark Ages. The engaging text has been supported by a black and white plate section. A refreshing aspect is that the author has avoided the temptation suffered by others to warm to his perception and advance only his conclusions. In this book the variety of views of a poorly documented period are reviewed and the author has offered his conclusions only where there are several supporting factors. A book to enjoy.